BETTY BLUE Original Movie Poster * Béatrice Dalle * 27" x 40" Rare 1986 Mint Condition. Large Wall Size measures 27" inches wide by 40" inches high. Original Official Advance Release Theatrical Poster for the 1986 U.S. Limited theater release of the film " Betty Blue ". 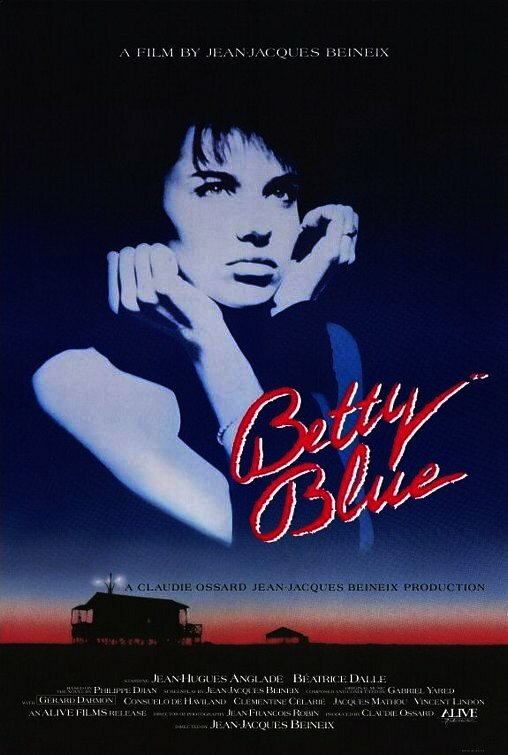 Betty Blue is a 1986 French film. Its original French title is 37°2 le matin, which means "37.2°C in the Morning". (37.2°C [99°F] is the normal morning temperature of a pregnant woman.) The film was directed by Jean-Jacques Beineix and stars Béatrice Dalle and Jean-Hugues Anglade. It is based on the 1985 novel of the same name by Philippe Djian. The film received both a BAFTA and Oscar nomination for Best Foreign Language Film in 1986, as well as winning a César Award for Best Poster. In 1992 it was awarded the Golden Space Needle of the Seattle International Film Festival. This Original Poster is printed in Brilliant Beautiful Razor-sharp 6 color production on thick advertising poster stock paper. Rare , Authentic , Betty Blue Original Collectible of a heartwarming drama. Ready for framing or simply hang as is. Great for an Apartment or Den , Entertainment Room or Office. This is a Very Rare Original One-Sheet Movie Poster. Will be gently rolled in a heavy duty tube and shipped Priority Mail with Delivery Confirmation / Tracking. This Original Poster is in Mint Condition. Email with any questions before purchasing if you are unsure about something. We ONLY accept Money Orders , Cashiers Checks or U.S. Cash as payment ( we do NOT accept personal checks or online payment at all ). Please email about local pick-up , we are located in NYC in Times Square. All International Customers MUST email us before purchasing this item.